Download the physical petition here: English and Chinese. Please return signed petitions to the Chinese Chamber of Commerce at 730 Sacramento Street or scan and email to sfchinesechamber@gmail.com. The unexpected passing of Mayor Ed Lee was devastating to our community. As a civil rights leader, Mayor Lee inspired all of us with his quiet dignity and gritty determination to lift up all of our residents. He led the City, first through one of the nation’s worst recessions and then through an unprecedented time of growth and change. As he steered the City away from fiscal disaster and toward solvency, he made sure no one was left behind. He saw to it that the wealth and prosperity of the City helped working families, immigrants and marginalized communities. His accomplishments were many, but because of his humble demeanor, we in the community feel that he didn’t get the credit he was due. 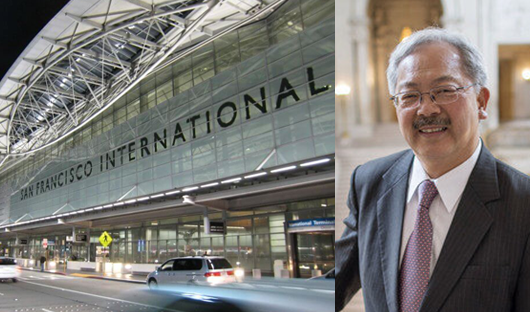 We’d like to properly acknowledge all that Mayor Lee did for us now by naming the International Terminal at San Francisco International Airport after Mayor Edwin Mah Lee. Why? Mayor Lee inherited double digit unemployment, a nearly half billion-dollar city budget deficit and out of control pension costs that threatened to swamp the city’s budget for generations. Ed Lee rolled up he sleeves and got to work. During his tenure, we reformed our pension system, created more than 140,000 jobs reducing unemployment to all-time lows, and, for the first time in decades, the City saw budget surpluses. When the economy roared back, Mayor Lee made sure that all boats were lifted, directing resources to address issues like affordable housing, homelessness and income inequality. His targeted strategies on housing resulted in an unprecedented pipeline of affordable housing and he oversaw a housing expansion not seen since the last century. He helped raise the minimum wage for working families, made historic investments in our public schools and rebuilt our City’s public housing. And, as the country saw a cruel reawakening of an era of anti-immigrant and anti-LGBT sentiment, and a steady attack on our San Francisco values, Mayor Lee stepped up and reaffirmed San Francisco as a place that would protect and welcome all. As a champion of civil rights and a leader who embodied San Francisco values, we can think of no other fitting honor than to name San Francisco International Airport’s International Terminal after Mayor Ed Lee. We ask the San Francisco Airport Commission for their full support.